GE Transportation weathers the financial storm and invests in Erie. Just two years ago, Erie-based GE Transportation appeared to be on the wrong track. GE made headlines and raised eyebrows with news of production cuts, substantial layoffs, and stock prices dipping below $8 a share. Many thought these setbacks, framed against the backdrop of a slumping global economy, would devastate the local economy, and unsubstantiated generalizations began flying: They're failing. They're leaving. We'll be another Detroit soon. Nowadays, during what GE calls its "Year of Renewal," the locomotive giant is once again steaming ahead on the right track, riding the rails to a new era of prosperity that promises to make them more viable in the global marketplace than ever before. This past September, the Railway Interchange 2011 conference was held in Minneapolis, Minn., marking the first ever combined railway industry event incorporating multiple facets of the industry including the American Railway Engineering and Maintenance-of-Way Association, the Coordinated Mechanical Associations, the Railway Engineering-Maintenance Suppliers Association, the Railway Systems Suppliers Inc., and the Railway Supply Institute. It also marked a major milestone for GE Transportation, who chose the internationally-attended event - and the largest railway show in North America - to announce something that just two years ago would've seemed near-impossible; the 4,500th Evolution Series Locomotive was in use, officially quashing fears of instability in the company stemming from a brutal global economic slowdown and essentially solidifying the "Year of Renewal" tagline the local locomotive giant has been associating itself with throughout 2011. First introduced in 2003, the Evolution Series is a line of diesel-electric hybrid locomotives designed to meet the EPA?s Tier 2 locomotive emissions. The "Evo" represents a $400-million investment made by the company to create its most technologically advanced, fuel-efficient, low-emissions heavy haul freight locomotive to-date. At present, the Evo reduces fuel use by 5 percent (or approximately 320,000 gallons over the lifetime of the locomotive), while lowering emissions by approximately 40 percent. As the bestselling locomotive produced by GE, it was named one of "10 Locomotives That Changed Railroading" by industry publication Trains Magazine, and was the only locomotive introduced after 1972 to be included in that list. "We've marked a historic milestone in the business, says Stephan Koller, Director of Communications and Public Affairs for GE Transportation, of the recent announcement regarding the Evolution Series. "We have transformed from a North American railway company to a global transportation business, and the Evolution Series is a critical part of that accomplishment." It's a very exciting time. This new plant is really to complement what we are doing here, but also to mitigate risks of being a sole supplier. GE may be celebrating today, but the company appeared to be on the fast track to nowhere in February 2009. Following shrinking freight volumes of U.S. railroads, order cancellations or delays, and decreasing production volumes as well as vigorous global competition, the company was forced to implement aggressive cost-cutting and containment measures, which included laying-off more than 1,500 salaried and hourly employees, 350 of which were expected to be permanent displacements. The news hit the community like a freight train, branching out like railroad tracks in a trainyard, leaving many to speculate just what future the plant had left in Erie. At the time, GE's locomotive production volume was projected to be more than 40 percent lower than the previous year. Nationally, the plant had just one order for 35 locomotives from a North American customer - a paltry number when compared to the 900-plus locomotives the plant reported producing in healthier years. Koller reveals that global orders from international customers in locations as diverse as Kazakhstan and China, as well as Australia and South America, helped keep the manufacturing plant chugging along during the volatile period. "We went through a very challenging time in the past two years, perhaps the worst economic downturn since the Great Depression," he admits. "And now we basically have returned to double digit growth in terms of revenue and profitability in the first and second quarter of 2011." 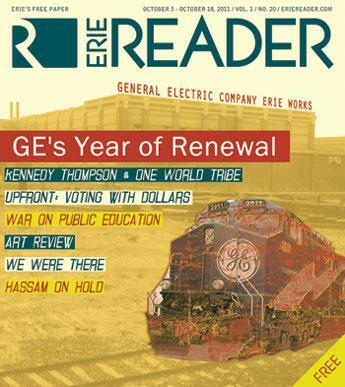 Even still, the "Year of Renewal" slogan falls short in describing GE Transportation's 2011. Not only has the company returned to double-digit growth, this growth has occurred at a staggering rate - GE Transportation reported $2.1 billion in revenue of the first half of the year, an increase of 45 percent compared to the same period in 2010. Segment profits for the same period were $335 million, up 135 percent, while the company received $2.3 billion in orders in the first half of the year. Additionally, GE reports that over 1,000 jobs were created in Erie in the past year and significant plans for upgrades to technology, equipment, and the campus of the more-than-100-year-old facility are underway. "There are three factors [to GE's growth this past year]," says Koller. "International trade is picking up, and when you have that, how do you move goods? With containers on boats and railroads. Then you have urbanization. The next 20 to 30 years you will see the emergence of metropolitan areas that don't even exist today. There will be a need for new transportation systems and smart transit solutions. There will be a lot of growth in this area. And if there's a building boom around the world you will need a lot of commodities coming out of mines, whether it is coal or copper or any other commodities. I think we are at the front end of some great developments that are really going to help us." The most major (and in some cases controversial) development is the unveiling of a new plant in Fort Worth, Texas. Still under much secrecy with an opening date sometime in the second half of 2012, the new site will be a 900,000 square-foot state-of-the-art facility and a $200-million investment for the company. More than 500 jobs are expected to be created with an additional 275 expected over the coming years. Walter Amaya, current Manager of GE's Grove City engine plant and an 11-year veteran of the company, was selected to head the Texas facility. "The business is investing heavily in improving the manufacturing and the technology of our product both in Erie and in our new site," says Amaya. "We will now be able to react faster to the demands of our customers. I've had the privilege to be exposed to different parts of GE's manufacturing and I feel honored to have this responsibility given to me. GE always prides itself on developing great products and great leaders. I think taking a passage from that foundation will be critical to the success of this new plant." "We are expanding our operational footprint in the U.S.," adds Koller. "It's a very exciting time. This new plant is really to complement what we are doing here, but also to mitigate risks of being a sole supplier. Look at the fire at American Biodiesel Energy Inc. and North American Powder Coatings in Harborcreek [earlier this year]. There was no back-up and it put the business and the customers at risk. We were basically a sole supplier to the rail industry. This was the only plant. By having the flexible production capabilities and being closer to customers will only strengthen us among our competitors. The demand is there and the growth is there. That's what drove this decision - how can we protect what we have and grow and move further. Texas is certainly part of that answer." But the announcement of the Fort Worth plant wasn't initially greeted with the pomp and circumstance GE hoped for. Much of the initial reaction locally centered around the farfetched idea that GE was just going to pick up and leave Erie - a move that, while not completely out of the realm of possibility - certainly weighed heavily on the minds of community leaders like Erie County Executive Barry Grossman. Contemplating a withdrawal by GE from Erie, Grossman says "calling it anything less than catastrophic would be an understatement." There are a lot of little, small companies around here; General Electric is their major customer. Now, if the GE plant left, most of that work would disappear as well. Echoing Grossman?s sentiments, a GE-commissioned study by Pittsburgh-based consulting firm Tripp Umbaugh laid out some statistics earlier this spring demonstrating the economic impact of GE Transportation on Erie County as well as the commonwealth of Pennsylvania. "We conducted an economic impact study during a time when we had a very low level of employment and even during that time it was determined our annual economic impact was $2.7 billion in Erie County alone and $4.6 billion across the state. I would venture that that's likely to be higher now that we?ve returned to a much higher employment level," says Koller. Even with Koller's belief that those numbers may now be higher during this, GE's Year of Renewal, the financial statistics revealed in that report remind us as a community how important GE is to Erie County's way of life. While one could speculate about ancillary business closures, declining tax revenues, and population loss, in the end, the only true measure of GE?s impact is the numbers in the Tripp Umbaugh study. "General Electric's been here over a hundred years, and has been a mainstay, obviously from employment, but what people don't realize is all the spinoff industries," says Grossman. "There are a lot of little, small companies around here; General Electric is their major customer. Now, if the GE plant left, most of that work would disappear as well." Koller agrees. "We maintain relationships with more than 100 suppliers in Erie County. For every job we create here, there are three additional jobs tied to it throughout our supply chain." Thus, the 5,000 jobs here in Erie (part of the 10,000 employed worldwide by GE Transportation) generate another 15,000 jobs that would most likely disappear. Those jobs, however, are not the only thing that would disappear; GE supports one in 11 jobs here in Erie County - jobs not directly related to the company's manufacturing activity. Just to put that in perspective, imagine every business in Erie County immediately losing almost 10 percent of their customers, 10 percent of their revenue, 10 percent of their profits, and 10 percent of their jobs. Theoretically, 10 percent of all of the area's businesses would fail and shut their doors - dry cleaners, auto dealers, taverns, clothiers, all of them. That 10 percent represents the disappearance of roughly $3.6 billion from northwestern Pennsylvania?s economic activity. Throughout Pennsylvania, GE Transportation is responsible for $1 out of every $130 in the Commonwealth's economy; revenue from the all of the Commonwealth's pro sports teams combined, as well as revenue from the mining, oil, and gas extraction industries could double in size, and still wouldn't replace those dollars. The contributions GE Transportation makes to our community go far beyond simply providing employment for generations of Erieites and customers for Erie's dry cleaners, auto dealers, taverns, and clothiers; a steady supply of skilled workers is what has kept GE in Erie for the past hundred years, and is what will continue to keep them here for the next hundred. Consequently, GE has been consistently active in educational philanthropy. The company has kept a vested interest in developing the next generation of world-class employees needed to continue the renewal of GE Transportation in Erie by way of several initiatives, including the GE Foundation's Developing Futures initiative, which invested $15 million in the Erie School District to advance math and science education for students as well as development opportunities for teachers. Additionally, GE has instituted the GO CollegeErie program, a $4-million grant to help local high school students pursue higher education and awarded Community Health Net two Developing Health grants totaling $500,000 to help increase local access to quality healthcare. Grossman calls the gestures "phenomenal" and thinks they show "they have been a good corporate neighbor" to Erie. The "Dare to Dream" Youth Empowerment Summit, held at the Bayfront Convention Center and presented by the GE Transportation's African American Forum this past September, is yet another recent example of the interest shown by GE in the educational attainment of Erie's students. Charged with "Empowering youth of our community to become productive leaders by developing their character, challenging their creativity, and inspiring them to excel in the classroom," students of East High School, Central Tech High School, and Strong Vincent High School were promised a surprise keynote speaker at the conclusion of the event, during which six GE employees served as panelists and fielded questions from students on how those employees had acquired the credentials to land a high-paying job at a company like GE. The panel consisted of mostly African-Americans and Hispanics; half of the panel members were women. All had bachelor's degrees, and most had master's degrees as well. The Keynote Speaker was Terrance "Terrance J" Jenkins, host of the BET television program 106 & Park, a video countdown show and the highest-rated show on the network since its inception in 2000. Jenkins talked about his own background and his persistence in chasing his dreams, dreams now realized. Master of Ceremonies Carlos "Los - 1" Ramirez summed up the event best when he said, "Anything is achievable. Your dreams are achievable. You can be whatever you want to be and have success no matter where you come from, what kind of family you had, or what kind of past failures you've gone through. Those are just stepping stones." Lest one consider GE's philanthropic activity a facade, a front, a pitiful handout of charity bestowed on the poor, waifish urchins of Erie, consider Koller's comments. "This is an investment," he says. "This is helping to provide opportunity, helping to grow this business, and helping to keep this community vibrant. When we talk about the next generation of technology, we are talking about a long-term view and commitment." The same goes for all the talk about the new Texas plant simply meant to "augment" Erie's operations - some think this is lip service on the part of GE, a smokescreen meant to conceal packed bags and train tickets to Texas. But why would GE continue to invest not only in GE's own infrastructure, but also invest in Erie's infrastructure, if their ultimate plan was to ride the rails south, leaving Erie at the station? "We want to see that return in many, many years to come," Koller continued. "We wouldn't make that investment if we weren't serious about this community." But how serious is Erie about GE? Erie acts like two slow years out of a hundred is cause for panic. Erie vilifies GE for laying off 350 workers, then ignores the thousand jobs GE creates later. Erie maligns GE when sales are slow, then gives GE little credit for clawing to the top of a crowded global marketplace. Erie interprets every savvy business move GE makes as a threat to Erie's vitality, then refuses to concede when GE succeeds. Erie won't even give GE the badly-needed community college they've been asking about. In this, GE's "Year of Renewal," perhaps it would serve Erie well to revisit, refresh, refit, and renew our own notions of the county's most eminent corporate citizen who, resting on a hundred year history in Erie, looks further down the track to the next hundred years in Erie. For more information on GE Transportation, visit www.getransportation.com. Cory Vaillancourt contributed to this story. Additional sources for this article include the Erie Times-News, the Sharon Herald, and the Star-Telegram.